The Zeta-20 measures and quantifies a full range of surface types including roughness and reflectivity. Unique transmissive and dark field illumination schemes allow the Zeta to handle the most difficult of surfaces. Surfaces are detected by combining an innovative optical design with a precision focusing pattern (ZDots). The ZDot focusing technology eliminates the complicated optics along with the laser and raster design employed by confocal microscopes. The result is a true color 3D image profile. 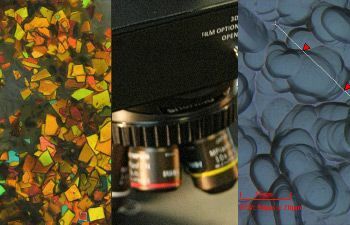 Unlike a confocal microscope, there is no need for periodic system maintenance or laser alignment. Even samples with low reflectivity or highly mixed reflectivities can be imaged by using ZETA’s high dynamic range imaging technology. 3D images are reconstructed using the ZDot technology by focusing on different sample planes as shown in the pictures below. On the left is a 3D image created from focal planes obtained from the top and bottom surfaces. Using ZDot technology, the multi-surface software feature can characterize up to 2 optically transparent layers on a substrate. Interfacial roughness measurements are quickly obtained using known refractive indices of materials. 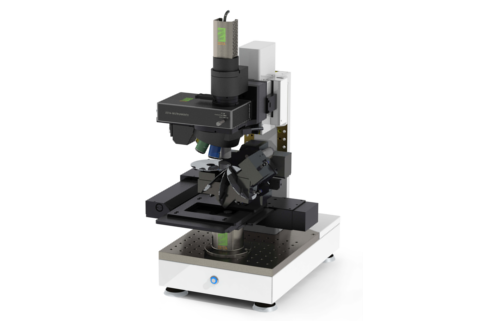 The Zeta-20 comes with a variety of software options including reflectometry and interferometry optical modes. The software is also customizable for application specific data acquisition. Optional accessories include a motorized turret, automatic defect inspection software (AOI), an edge inspection fixture, a piezoelectric z-mechanism, and a diamond scribe marker. A motorized XY stage is optional for the Zeta-20. Many of these accessories provide automation features for the Zeta-20. These 3D optical profilers are compatible with Olympus lenses and with digital cameras.